Cool, the table widget thing that I used for the PDC final worked the first time, then I tried to centralise the text, it didn't work, and now on future tries it also didn't work, so a screengrab it is. We've got the number 1 seed against the number 2 seed, something that hasn't happened in the BDO since 1999 when Raymond van Barneveld beat Ronnie Baxter 6-5. Will this be as close a game? I really can't see it. Durrant's played great throughout the tournament, only really being threatened against Jim Williams in the quarter finals where he had to rally from 4-1 down in sets, but that was an incredible push where he won twelve out of thirteen legs, denying Williams even the slightest chance of winning the match, slamming in four of his eight four visit legs in that spell. McGeeney in contrast has only really looked good in his win over Danny Noppert - Martin Adams really should have seen him off in the very first match of the entire tournament which went the distance, as stated the Noppert game was fine and the only match where he managed to win more than half his legs in fifteen darts, surprise package Wayne Warren had his chances in the quarter final, getting a good lead but not being able to kill 120 in the eighth and then faltering in extra time in the deciding set. Unterbuchner, another surprising player who you've got to think you'd see taking punts at the European Tour next year, also could have taken the semi final to a deciding set, but his scoring deserted him when offered six visits to break in the last leg of the tenth set. Durrant wins this. He's been playing far, far superior darts to McGeeney across the whole week, and across the whole year really - dating back throughout the entirety of the stats I have in my database, including last year's Lakeside, McGeeney has won 100 legs, of which only six were in four visits, and just 42 in total were in five visits. He's also lost more legs than he's won in that sample, averaging just 85. So while McGeeney's numbers for this Lakeside look poor, they're actually a bit better than his historic numbers. The bookies have Durrant at 2/11, and this could end up being even more one sided than that, the score predictor I use thinking that 7-1 or 7-2 Durrant seems like the most likely set of outcomes. I'll probably watch it, because it ought to be quick. It's a shame that Durrant now looks like he's sticking with the BDO, he could have made a real splash in the PDC, but at the same time he seems that much better than everyone else that he may as well keep printing money and test himself in the Grand Slam, perhaps take a punt at the UK Open as well. Coming soon will be the FRH year end awards, I might do them after the final. The final round 1 game has just finished, and outside of Jamie Hughes going out to German qualifier Michael Unterbuchner, there's been a shortage of real shocks - 11 of the other 14 seeds have made it through, and I don't think anyone would have been too stunned to see Whitehead over Menzies or Waites over Montgomery - the Warren over Harms result is a bit of a surprise I guess. So what about the last 16? 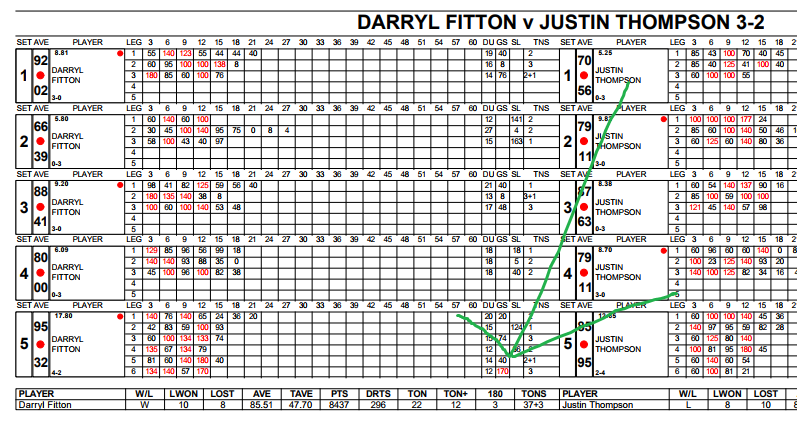 Durrant - Fitton: Fitton only managed 5/10 legs in fifteen darts, Durrant got 6/9 - Durrant's shown what he can do over the last twelve months, particularly recently at the Slam, while Fitton's never shown that he can put together a string of tidy legs that might trouble Glen over a seven set match. Whitehead - Williams: Conan got 5/11 legs in par, Williams 4/13. This is a concern for the seed who didn't have anything like an easy game against Nilsson, Whitehead's scoring when losing was also over five points higher than Jim's was, so the seed could be in a spot of bother here. Pity I don't have any stats from the Zuiderduin to look at. Waites - Reynolds: Dean got just 3/10 legs in par, but so did Waites. Reynolds is in a few stats over the whole database, both in BDO events and the UK Open, and this is his normal game it seems. Waites is a touch better on average, and can certainly hit a higher peak, if it gets into a longer game his experience and general better standard should show. Mitchell - Baetens: I mentioned Scott's performance in the previous post which was clearly the best so far by some distance, Baetens pulled together a weak 4/12 legs in par and with nothing else to compare it to, I can't think of any reason not to think Scott advances here. 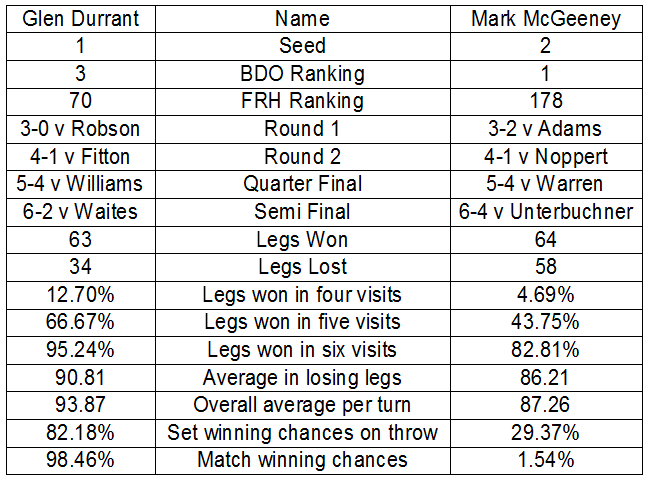 McGeeney - Noppert: Noppert's played the better in both his prelim and first round game, we've known this one for a while, at no point in any of my database has Mark put in a performance that makes me think he can beat Danny if he continues to play as he has been doing - only really the last Slam match looked OK but he was drawing very thin if not dead at that stage so there's not much to read into there. Warren - Mandigers: Wayne had a great first round game to eliminate Harms, while Mandigers had an otherwise alright 5/9 par legs. Question is whether Warren can sustain that level over a longer game, looking at limited previous stats I'd think Willem could, if Warren could then I think we'd have seen more over the course of his career. de Vos - Veenstra: Low country derby here, Geert wasn't too impressive in beating the Dutch qualifier Telnekes with 3/11 legs in par, whereas Veenstra clocked in 7/12 being pushed hard by Kyle McKinstry. Veenstra was similarly impressive last year before running into Danny Noppert, de Vos played much better than this last year. Geert will need to step his game up and if he doesn't he'll lose, but he's certainly capable and this could be a good one. Unterbuchner - Phillips: Michael was pretty average in his qualifier with 4/12 legs in par, and only had a slightly better 6/15 ratio in beating Hughes, but he's quietly got three twelve dart legs, so is showing spurts of class, Phillips only got 2/11 legs in par earlier today in an awful match where only three of the twenty legs combined were able to be finished in fifteen darts, he can very occasionally turn it on (see some of the later World Trophy games), but is usually incredibly mediocre even by BDO standards and should lose this one. Wow, what a performance by Rob Cross that was. Simply didn't give Taylor any chance whatsoever. Pity Phil couldn't pin that nine darter, oh well. Think it's been a really interesting tournament to see a lot of newer names progressing, which has resulted in big churn in the Premier League. Can't argue with any of the selections and it's the ten that I would have chosen - they've got numbers 1-12 from the FRH rankings excluding Taylor and Chisnall, which seems fine to me. Would have been a bit too early for Lewis or van den Bergh, and could probably have done their careers more harm than good, nobody else was making a compelling case. Darren Webster maybe, but that's about it. In total, that's a churn of 24 players, the highest ranked player form last year not to reappear being last season's number 59 Mark Frost (although he wasn't far off). Obviously Rob Cross is the highest new entrant, but three other players managed to crack the top 50 from outside last year. So what for the FRH Second Division Darts for this season? I'm going to score it a little differently this year - rather than just taking the first result between players, I'm going to add up all the legs won and work out the percentage each wins against the other. If you're 75% or over, that's the full two points, 25% or under, zilch, and progressing linearly between the two. Who will we invite? That seems like a good selection. I was tempted to say that if Durrant went deep at Lakeside, switched and won his tour card that I'd invite him straight in, but that's a big combination of if's. For those that are high up that missed out, van de Pas, Huybrechts and Klaasen have done little all year and all crashed out of the worlds at the first hurdle, Bunting's getting back there but hasn't shown quite enough yet. Lewis at least showed the quality in the Matchplay and is probably the biggest name not in the Premier League proper, Anderson's won on TV and the tour, Webster and Cullen have had great years on tour and Webster also had a solid worlds, while the other Lewis and Dimitri crashed the worlds and made huge breakthroughs that I think warrant entry into this. I just hope Adie plays enough that he can match up frequently with these, but being out of the top 16 basically forces him to. Once we're under way I'll make a spreadsheet and put up a link in the links bar rather than post updates in here. I hope to get some brief BDO analysis up later in the week, I also intend to shove the Premier League players through the master computer and project what'll happen in the first nine weeks.